Virgin Media Samsung V+ review | What Hi-Fi? After the fisticuffs between Richard Branson and Rupert Murdoch some three years ago – when Sky removed and then, £38m later, restored some of its premium TV to Virgin Media – Virgin is shaping up as real competition to Murdo's grand satellite empire. The latest addition to Virgin's set-top boxes and digital services is this new Samsung V+ Box. The existing V+ box will still be available for a few months to come, but the new Samsung is a clear notch up in terms of both style and usability. It's smaller, sleeker, comes with a fascia display for easier station identification and even responds more rapidly to remote commands. 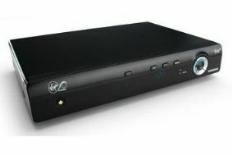 However, whether your installation features the existing or the new box (you don't get a choice), the key V+ Box features are identical: you get a three-tuner PVR with pause and instant rewind, a neat seven-day electronic programme guide, and 160GB of recording space. The big selling-point, however, is Virgin Media's peerless access to the online material on offer from BBC iPlayer, Channel 4's 4oD, and limited programming from the recently added ITV Player service. Virgin also provides lots of its own VoD content. We're talking up to 500 movies, and thousands of TV shows. And the HD picture quality available is stunning, with high-definition channels benefiting from 5.1 sound (sent via a separate optical digital out) which is a big bonus if you have a decent surround system. In the past, we felt Virgin's main problem was its lack of high-definition content – while it touted the joys of video on demand, the competition was beefing up its high-def programming. Recently, though, the company has changed tack, doing deals to secure more HD shows. At this stage, the content isn't exactly overflowing, but it's far, far better than before – with BBC's high-def content through BBC HD and iPlayer, plus HD material available on demand. And as you can read in our News channel, we've learned that Virgin plans more linear HD channels to bolster its offering later this year. With our major concern now – more or less – eased, perhaps our only other gripe is that the V+ could up its capacity (its 160GB is only 20 hours of HD), but apart from that, we've no complaints. To find out more about Virgin Media's plans for more high-definition TV and video on demand, read our exclusive interview in the Ultimate Guide to Television 2009, on sale now.